Anti-Americanism is a far from homogenous phenomenon — even in the Islamic world, where the press would sometimes want to convince us that a near-unanimous hostility to the United States exists. This book, by dint of on-the-ground research into Muslim views of the “Great Satan,” shows that far more sophisticated explanations are called for. Traditional respect for America’s role in the world remains strong in several countries, while in others deep antagonism remains. The key determinant of the latter is U.S. foreign policy. The contributions to this book range widely over the underlying causes, manifestations, and recent development of anti-Americanism in the Middle East, the Maghreb, sub-Saharan Africa, and Southeast Asia. 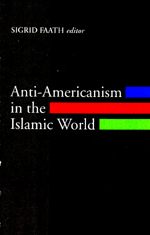 Among the topics discussed are the historical antecedents of fear or hatred of America, the cultural and economic aspirations that bind many Muslims to the American model despite entrenched prejudices and official attitudes, and the diversity of opinion on the costs and benefits of emulating the American way of life. From this comprehensive account it emerges that the tide of opinion does not flow in a single direction, and there are many opportunities for mutual respect and understanding to grow between the United States and some of its more vocal critics. Sigrid Faath is a senior lecturer in the Department of Political Science at the University of Hamburg, and scientific director of the Middle East research programmme “Menavision 2010″ of the German Institute of Middle East Studies, also in Hamburg.